LOS ANGELES, Sept. 27, 2018 /PRNewswire/ -- Southern California Gas Co. (SoCalGas) today joined the Coalition for Clean Air (CCA), local elected officials, industry representatives, businesses, and community leaders at Union Station in Downtown Los Angeles to announce plans for California Clean Air Day, a multifaceted, statewide program built on the idea that shared experiences unite people to action to improve community health, taking place on Oct. 3, 2018. In celebration of Clean Air Day, SoCalGas has pledged to reduce its yearly use of air conditioning at each of the company's 60 work locations on an ongoing basis, starting on Oct. 3, 2018. The new initiative is expected to reduce the utility's overall electricity usage by more than 86,000 kWh per year – the equivalent of more than 157,000 miles driven by an average passenger car. In addition, more than 125 SoCalGas employees, so far, have taken the Clean Air Pledge, which includes actions like reducing car use by telecommuting, taking mass transit to work, biking, turning off lights, changing the filter in their car or home heater, planting trees, and encouraging friends and family members to take the pledge. Photos from this morning's event are available here. "Earlier this year, California celebrated as we announced that our statewide efforts had reduced greenhouse gas emissions below 1990 levels and four years ahead of schedule," said George Minter, regional vice president of external affairs and environmental strategy for SoCalGas. "But a closer look at the data shows that GHG emissions from the transportation sector are actually increasing. And this year, we had more days with unhealthy air than at any point in the last two decades. We can address pollution and emissions linked to climate change today with balanced energy policies that encourage the rapid deployment of near-zero emissions natural gas trucks fueled with renewable natural gas sourced from farms, landfills, and wastewater treatment plants." "Heavy-duty trucks fueled with renewable natural gas reduce air pollution and help protect against climate change. It's a win-win combination," said Joseph K. Lyou, Ph.D., president and CEO of the Coalition for Clean Air. Earlier this year, SoCalGas announced that, for the first time, renewable natural gas produced from organic waste was being introduced into the company's pipeline system. Renewable natural gas is already being used by a local waste hauler as fuel for 400 of its collection trucks and is reducing emissions equal to taking 130,000 cars off the road. SoCalGas also recently announced it will soon begin using renewable natural gas for the first time at the 25 utility-owned natural gas vehicle fueling stations across its service territory, as well as at six fueling stations in the San Diego area. SoCalGas is a leader in reducing emissions. Since 1990, the company's energy efficiency and rebate programs have reduced emissions equal to taking almost 700,000 cars off the road. 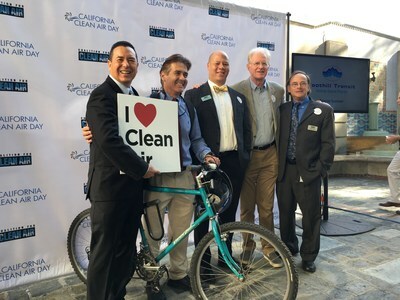 Through the Clean Air Pledge, individuals, communities, businesses, government, schools, and other organizations across California commit to taking simple, personal actions to clean the air in ways that makes sense for them. Clean Air Day is a project of the Coalition for Clean Air. For more information about Clean Air Day, visit www.cleanairday.org. Today, the transportation sector is responsible for about 41 percent of California's greenhouse gas emissions and 80 percent of smog-forming pollution. The latest heavy-duty natural gas engines can cut smog-forming emissions by more than 90 percent compared to the cleanest heavy-duty diesel trucks on the road today. And, when near-zero emission natural gas trucks are fueled by renewable natural gas, greenhouse gas emissions are reduced by at least 80 percent. Each heavy-duty diesel truck that is replaced with a near-zero emissions natural gas truck is equal to removing 57 passenger vehicles from the road. Already, close to 70 percent of natural gas fleets in California are fueled with renewable natural gas. In support of renewable energy and the state's vision of a low-carbon future, SoCalGas has been working to rapidly expand the production and use of renewable natural gas in California. Renewable natural gas is a carbon-negative fuel produced from waste found at landfills, wastewater treatment plants, and agriculture and dairy farms that can be used in trucks and buses, to generate electricity, fuel heating systems in home and businesses, and for cooking. In addition, new research shows that renewable natural gas can play an important role in lowering carbon emissions in buildings. The analysis forecasts that replacing roughly 16 percent of the traditional natural gas supply with renewable gas captured from sources like dairies, wastewater treatment plants, and landfills can achieve greenhouse gas reductions equivalent to converting 100 percent of buildings to electric only energy by 2030. By using a mix of both in and out of state resources, the renewable natural gas strategy is three times more cost effective in reducing greenhouse gas emissions than an electrification pathway. SoCalGas also recently joined a new international collaboration with Canadian natural gas utility Énergir and French utilities GRDF and GRTgaz aimed at advancing the research and development of renewable natural gas and renewable energy storage technologies, such as power-to-gas. To help educate the public on renewable natural gas and assist developers who may be interested in interconnecting to the SoCalGas pipeline network, the utility developed a downloadable tool kit. Watch this video to learn more about the environmental and cost-saving benefits of renewable natural gas: Digesting the Facts About Renewable Natural Gas.